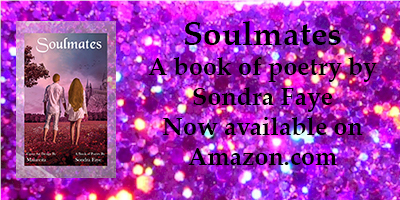 Soulmates is a collection of poems that covers topics of universal love, astral projection, paranormal poetry,loss of a child, mysticism, apathy, anger and compassion. Sondra Faye also added some black and white drawings because she thinks sometimes a picture is a poem. “here” is a collection of poems; some were printed in various literary poetry magazines. John Keats and Edgar Allan Poe as muse; a paranormal flare is infused in the nakedness of the words in “here”. Amidst unfiltered subjects about passion, flirtation, human sexuality and unsympathetic love, Sondra Faye writes intimate poems about her friends including a poem about the tragic young death of one of her best friend’s twin sister. A multi-media artist and poetess she considers herself lucky to live on a planet where it’s okay to be addicted to poetry. Her intention for anyone reading this book is that they will stay inspired and find happiness inside the reason they are here.